About a month ago I was busy working on my next module, Heart of Fire, when I decided to take a minor diversion and do something different. I chanced across the D&D 3.5e book Weapons of Legacy by Bruce Cordell, Kolja Raven Liquette and Travis Stout... and realized that such a thing didn't exist in 4E. The closest thing was using inherent bonuses, but beyond that players were limited as to how their weapons could be upgraded without being replaced. If you have a +3 sword you had it until you found a +4 sword, at which point you would toss the old one aside as if it was garbage or melt it down in to slag. Selling it was pointless - considering the two items are at least six levels apart the resale value would be inconsequential - so the players just threw it in a corner of the dungeon and forgot about it. I originally set out to create a system by which a weapon could increase in power along with the player, and not just by increasing its attack bonus by one. I wanted legendary items that had a whole slew of powers that the player can use as they became "attuned" to the item over time. But I did not want an artifact... These items aren't made to be sentient or intelligent. They do not have mood swings, have desires or get emotional. They just get more powerful, that's all. Thus Items of Legend was born. This supplement provides basic rules for items that grow in level through exposure to the player that wields them. Included in the document are six items, some of which honestly have been influenced by video games of my past (Ultima VII, Everquest II, even a certain LucasArts game). And it's not limited to weapons; this mechanic can work for anything. I hope this is useful to some of you. Eventually I might create more items that follow this mechanic, and I don't know if I'll post them here or make a sequel. We'll see. 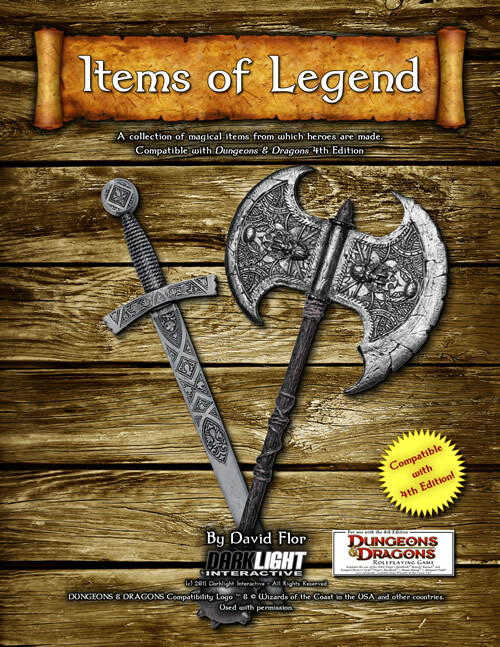 For now, you can pick up Items of Legend on Drive Thru RPG! At the same time, while you're at it, all of our other products are on sale for the low price of $1.99 for today only! I'd like to take this opportunity and thank Stephen Newton of Thick Skull Adventures (http://www.thickskulladventures.com/) for editing this document. As I've said many a time before, fluff and extended writing isn't my specialty, so my grammar and way of expressing myself has its share of issues. I appreciate his services, and he helped make this product much better than it would have been doing it myself. Thanks! Nicely done! I’ve always liked the idea of a signature weapon or item to help define a character. You don’t see Drizzt ditching twinkle in some corner of a dungeon! Awesome concept.